The LAUDA-Noah TherMOstat is for use on MOCVD, ALD and other process tools using source bubblers. Conventional open-bath, air-cooled chillers evaporate and condense moisture at or below dew-point temperatures. Moisture released into the tool electronics cabinet can lead to reliability issues with process tool electronics and contribute to temperature drift. The heat exhaust from the most commonly used open-bath chillers also interferes with process tool electronic calibration and stability, leading to poor reliability, higher CoO and increased down-time. Open bath chillers simply do not have adequate temperature control resolution to manage the gas vapor pressures as a function of temperature. 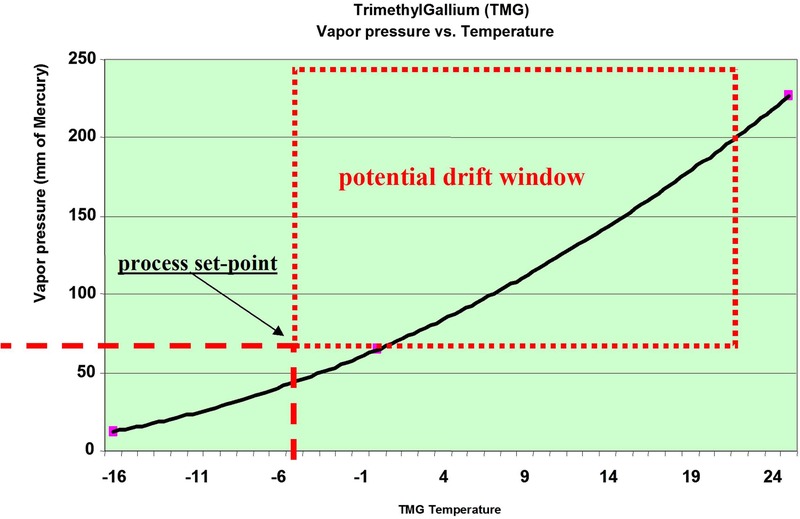 The graph below shows an example of TrimethylGallium (TMG) Vapor Pressure vs. Temperature and the potential drift window. Metal organic temperature control is critical to process stability and an essential prerequisite to maintain uniform vapor pressure and evaporation rates. The LAUDA-Noah therMOstat utilizes proven and reliable thermoelectric technology and includes Devicenet communication functionality. This system provides unparalleled reliability, low Cost of Ownership and temperature control accuracy of +0.1 °C. Diameter - 2" to 4"
Length - up to 10"
Diameter - 4.2" to 6.69"
Length - up to 16"
Diameter - 2" to 6.69"
Please contact LAUDA-Noah for more information about the TherMOstat.